Time and time again, clean, organized, aesthetic design and visuals on turn up as key to any Digital Humanities project we have done in class so far. For example, GIS mapping projects should not have all of its data sets appear simultaneously, and should give the viewer the option to toggle on/off individual data sets. In the case of Digital Archives, once again, choice of colors and images used on the home page can have a substantial impact on how the user may come to understand what the theme binds together the information in that particular archive. This quality is what separates reliable DH projects and questionable ones. All the information used in any particular project should be traceable to their original source, whether it be primary or secondary, especially if the information used did not belong to the makers of the DH Project. On a Digital Archive, this would appear perhaps at the end of each object page or whenever a reference to information that was obtained outside the DH project itself. Considering that every individual who makes or uses a DH project are not from computer science disciplines themselves, navigating these projects should feel “organic” or fairly easy to learn. 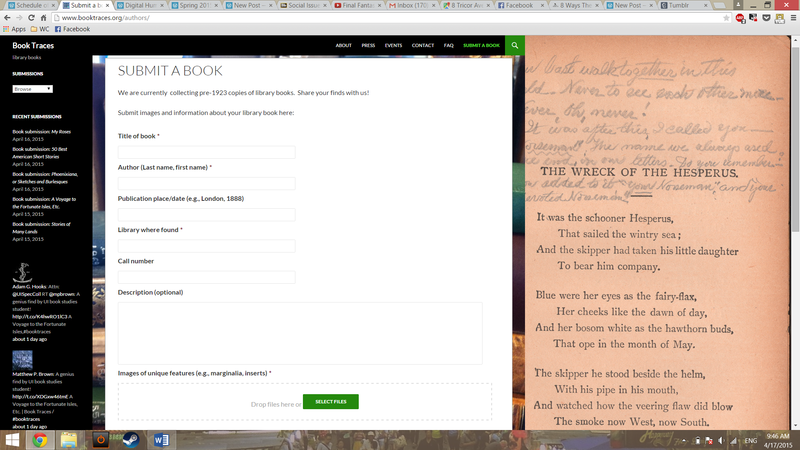 Book Traces is one example of such, where the form to fill out the book submission is extremely easy to understand, and even provides an example on the side. On of the advantages of a DH project over physical paper representations of it, is that the user is able to interact with the project by manipulating when certain bits of data or information are shown at a time. The overlay feature of GIS mapping projects is one example of this, or clicking on a pin to reveal more information about that location is another. A not so good example of this would be the maps shown on the “Art in the Blood” fan project. Last, but not least, DH projects allow for extensive amounts of collaboration with individuals who need not presently be there to do so. So as long as he or she may have access to the tools online needed to make the project, any person can continue on another’s work so as long the project is open to the public. Again, Book Traces is an elegant example of this as contributing to the project’s storehouse of 19th century Marginalia is quick, but thorough. In Sir Arthur Conan Doyle’s Sherlock Holmes short story, Scandal in Bohemia, Holmes and company have discovered Irene Adler has eluded them after a servant has informed them of her departure for a 5:15 train at Charing Cross. The station itself, is located on a fairly large road known as, “The Strand”. 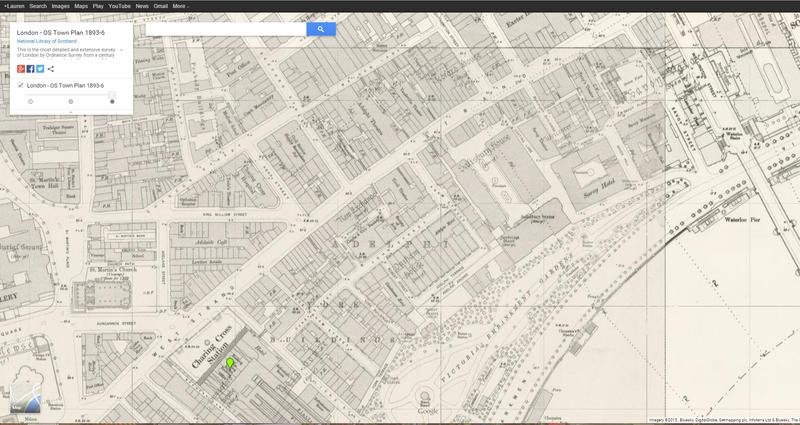 Charing Cross Station is marked by the green pin. After performing last week’s topic modeling on all 56 Sherlock Holmes short stories, 10 out of the 100 topics generated from last week were put into Google’s Fusion Tables to check for trends in the 10 particular topics of our choice. I chose to mainly look at the time period from January 1892 to July 1893 being that it contained a high concentration of published Sherlock Holmes stories. 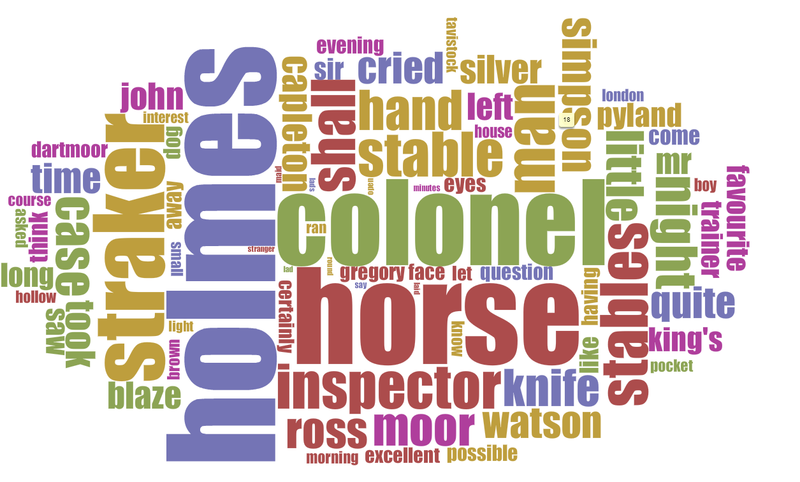 Using Mallet’s Topic Modeling program, DHM293 ran all 56 Sherlock Holmes short stories with various settings. Changing the number of iterations and topics, I finally settled on settings of 100 topics and 2000 iterations, with 20 words in each topic. 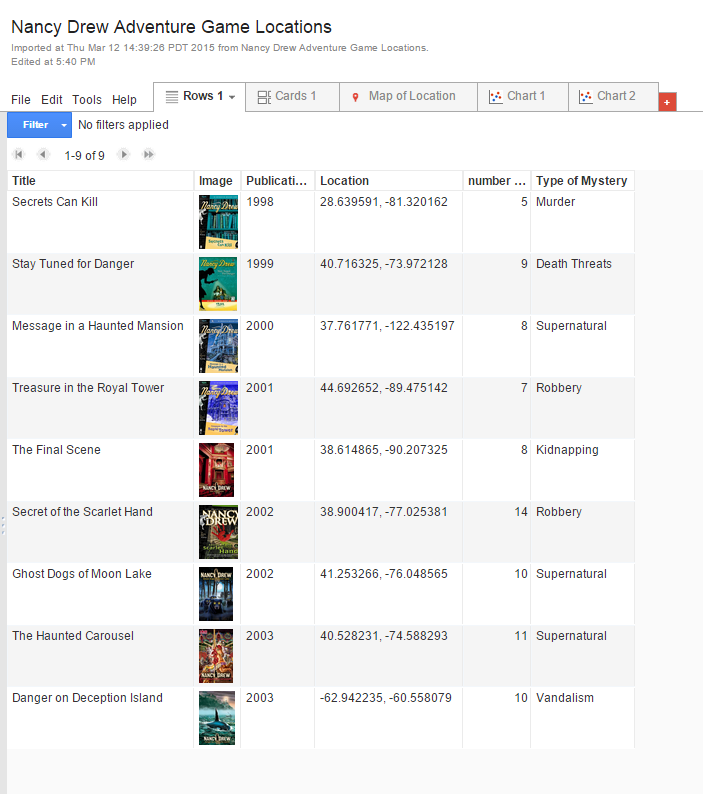 Lauren Gao’s Google Fusion Tables: Where in the World did Nancy Drew Go? Well, wrong game. 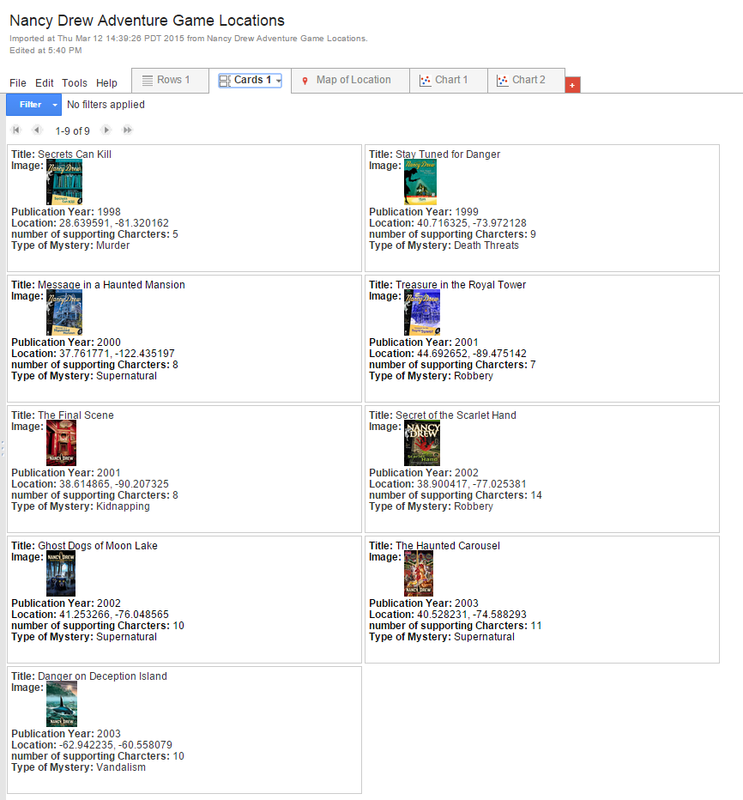 However, for this week’s assignment, I put together 10 of the Nancy Drew adventure series games to practice using Google’s Fusion Tables. While ten games, each with different locations, are not enough to grasp how well-traveled Nancy Drew is, I collected information on where each game was located, what year the game was published, how many supporting characters there were, and what kind of mystery Nancy Drew had to solve. Most games were set in actual states or locations, but often the town or building in question was a fictionalized location. A trend that came up during my data visualizations was that the later the year, the more supporting characters the game was likely to have. Additionally, the type of mystery with the most supporting characters was “Robbery”, which was the mystery in the game “Secret of the Scarlet Hand”. For this week’s assignment, I chose to look at the three terms”daguerreotype”, “camera obscura” and “photography” in google’s Ngram viewer. All three terms ultimately relate to the create of photographic processes that we know today more informally as film photography, which preceded digital photography. Daguerreotype and camera obscura are two processes that entail reflecting light off of metal or other surfaces capable of bouncing light to capture images on another surface. These two terms were also the earliest forms of producing almost perfectly replica images in the way modern photography does. However, these two terms are not quite know outside of art history classes or photography majors yet the concept of photography is so integral to today’s society. Why is that? In an attempt to answer this question, I put these three terms into Ngram and the results are reflective of their status in the 19th century. Word clouds are an interesting way to get a broad insight on the trends of a text or the data that could arise from it. Usually applied to interviews, documents, or other mediums of text, the diagram showcases the most often reoccurring words from the largest (most frequent) to the smallest (least frequent). As for the question of how accurate the representation of the data truly is through word clouds or tag clouds, remains to be seen. To see this for myself, I put Arthur Conan Doyle’s “The Adventure of Silver Blaze” through two word cloud programs, Voyant and Tagxedo. Before I layout what the general premise of the story is, it might be more interesting to see how good of a job word clouds do in “giving the whole picture” of the story.